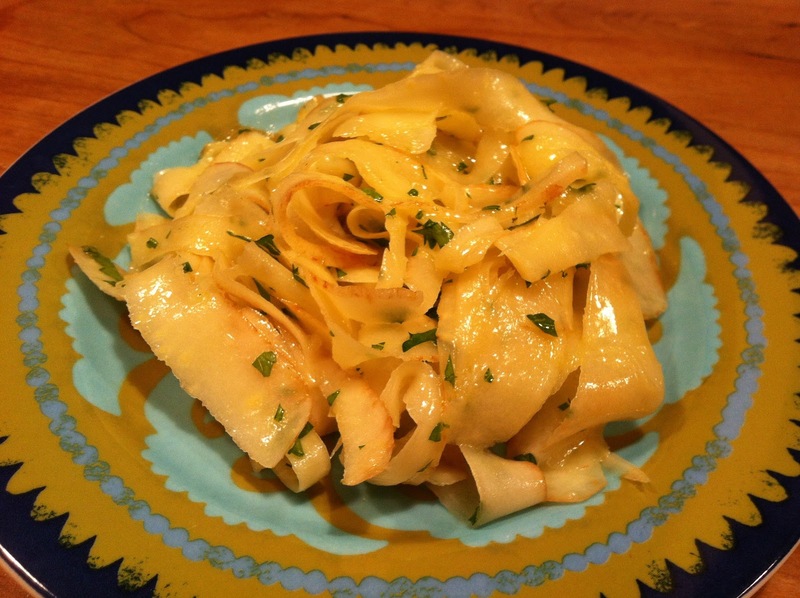 David Doesn't Bake: Parsnip "Fettuccine"
Here’s a great twist on parsnips , “Parsnip Fettuccine.” To start, get some salted water on the stove for blanching and wash your parsnips thoroughly. Next, hold the top of each parsnip and run a vegetable peeler from one end to the other to create a long ribbon. Turn and repeat until you’re down to the tough woody core which you can compost or snack on if you’re looking for a quick fiber fix. Place the parsnip ribbons in the simmering water for 45 seconds, drain into a colander, and rinse with cold water. Before serving make sure your ribbons are fairly dry, patting with a towel if necessary, then simply toss with extra virgin olive oil, chopped garlic, parsley, and kosher salt. I’ve also sautéed the ribbons with garlic and thyme instead of blanching, carrots work too. Try it soon, won’t be long before we have some fresh greens to work with.